A lot of business owners offer affiliate programs without considering the value equation. Do you have an affiliate program? Are you offering more than you should? Find out the answers in this episode. 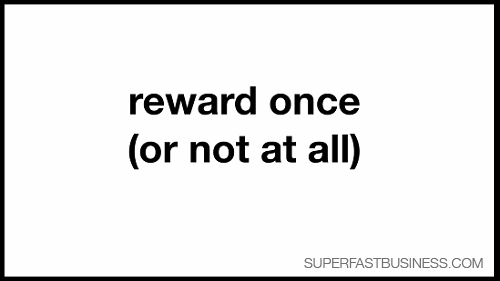 How should you reward your affiliates? Are you overpaying your affiliates? [Click To Tweet]. YES to front end, NO to back end. [Click To Tweet]. Get promoted with less friction. [Click To Tweet]. All right. So now we’re going to move on to affiliate marketing, and this one is my counter-intuitive tip that you may not hear very often. But I do predict it’s a trend and this really goes to the core idea that a lot of affiliate programs, and perhaps you have an affiliate program where you have people selling your products or services, or you’re thinking about it. A lot of affiliate programs over-reward their affiliates and they’re not applying the 80/20. When I looked at all of the sales that I’ve had affiliates made for me, there was a trend; and firstly, only a few affiliates really put in the effort to get a significant amount of the affiliate commissions, of which I think I’ve paid more than a million dollars. Secondly, I was overpaying some affiliates who were reintroducing me to customers I already knew, over and over again, and then they are getting paid recurring. And it didn’t make sense. One of the core metrics that you could consider is: could you invest that amount of marketing to get the same customer or less? Because if you can, you might as well do it. And when we get to the strategy tip, I’m going to show you how you can incorporate advertising into your repertoire without you having to do it yourself. So my tip for affiliate marketing is: if you do have an affiliate program, reward your affiliates once, if possible. Give them a big payout. Even 100% of the first sale if you want, but just keep it to one payment. For example, pay them on the front end but not on the back end. And just be realistic about the marketing budget. Remember, if you’re giving them half your sale on a recurring basis, you’re giving them 50%; that’s a 50% marketing cost. And now your profit is 100% less the 50% for the affiliate, less whatever other costs you’ve got to run your business. It can start to whittle down your affiliate thing. So, consider either a lower percentage, a single reward, or my preference, no affiliate program at all. And when you have no affiliate program, there’s a few things that happen. One is, you have to earn your traffic. You have to get out there and do something worth for people to talk about, because they’re going to refer people to you just because your stuff is good, because you get results, or because you have reputation, not because they’re getting paid. So you don’t have pimps anymore. You’ve got word-of-mouth promoters. Another thing that happens is that people start to talk about you or promote you with less friction. If you think about it, if someone would go and promote me or mention me in their Facebook feed or in their blog, they might be tempted to stop, go and find my affiliate program, join up, get the link, cloak it, and then go back and then maybe, if they remember to post something, versus just sharing or clicking tweet or Facebook on my post and not even thinking about the affiliate program. And then when I appear on podcasts, I’m giving great content to my host. I’m tipping my barrel out of the best ideas. It’s nice if they can then reciprocate by promoting my website. Now if they want to stick an affiliate link, now I’m going to give them half of my stuff forever, just because I went on their show and gave them value. So think about the value equation and what’s fair. I think the affiliate equation also differs between companies selling products and individuals selling products. Seems more applicable to larger companies than individuals reciprocating for one another.